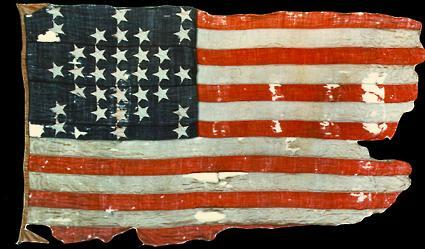 Exactly 150 years ago today on April 12, 1861, the American Civil War began in earnest. At 4:30 a.m., Confederate batteries on the shores of Charleston Harbor in South Carolina opened fire on Fort Sumter, the Federal-held fortification that dominated the harbor after commander Major Robert Anderson refused its surrender. The resulting bombardment went on for 34 hours, with Confederate artillerists lobbing over 3,000 rounds of shot and shell in the fort's direction. While the fort's masonry walls were battered and many of its wooden buildings were set alight, there were no fatal casualties on either side during the engagement. Ironically, two Union soldiers were killed when ammunition was accidentally ignited during the 100-gun salute to Fort Sumter's tattered but intact American flag. 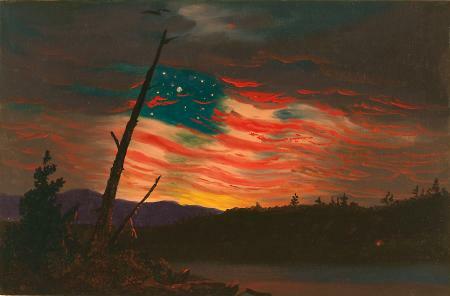 It is this flag that is thought to be depicted in the de Young's Our Banner in the Sky, believed to have been created in 1861 by American landscape painter Frederic Edwin Church. Major Anderson took Fort Sumter's flag with him back to the North, where it became the focal point of numerous patriotic rallies, the first of which took place in New York City's Union Square. With over 100,000 attendees, it was the largest public gathering in the United States to date. The celebrity flag toured countless cities throughout the North, where it raised funds for the war effort by being auctioned off. The winner naturally donated the flag back to the nation to be auctioned off again at the next rally. In April of 1865, Anderson, now a major general, returned to Fort Sumter and raised the flag over its ruins as part of the celebration of the Union's victory. Church's allegorical painting depicts the famous flag as part of a twilight landscape. A bare tree trunk in the foreground serves as a flag pole, and the colors of the sunset form the red and white stripes. A break in the clouds reveals stars upon a deep blue firmament. Note that the stars in the painting accurately reflect the unique diamond pattern on the fort's flag, which can be seen today at Fort Sumter National Monument. Our Banner in the Sky can be seen in the de Young's Gallery 26, among other examples of 19th-century Hudson River School painting, including Church's monumental 1866 Rainy Season in the Tropics.